Streptocarpus ‘Cranberry Velvet’. 2000, IR00721, J. Ford, OH. (‘ White Christmas’ x ‘Silhouette’). Cross made July 1998, first flowered June 1999. Plant fertile but reproducible only vegetatively. Compact rosette. Leaves medium green, bullate, linear with acute tip, cordate base and serrate edge. Calyx split. 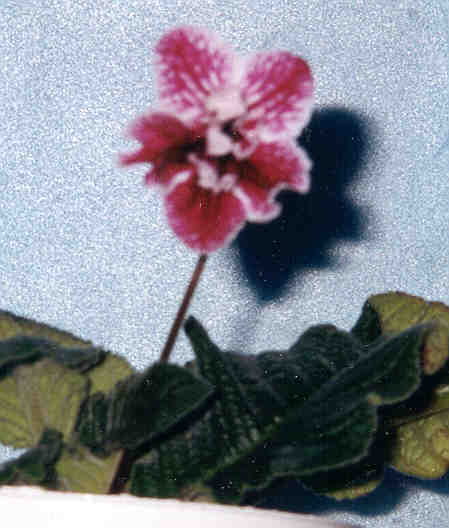 Corolla double, salverform, 2.5 cm long, 4.25 x 4.5 cm in diameter, bright cranberry, lower lobes have large white edges with cranberry veins. Top lobes are white with cranberry veins, double lobes are white with cranberry veins, some slight ruffling on the edges. Available from Rock Bottom Farms, Middlefield, OH.